Solid Wood is the number one choice for drawer boxes and is available in all our dovetail drawer box options. 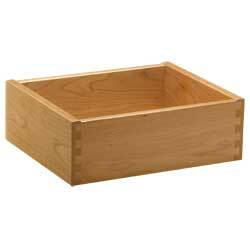 Solid wood drawer boxes give a high-end look to any project with stunning wood grains and natural beauty. The coordinating plywood bottom provides strength and durability for holding drawer contents. Solid Wood boxes are available in a large variety of species including but not limited to: Maple, Cherry, Aspen, Red Oak, White Oak, Walnut, Alder, Beech, Cedar, Bamboo Edge Grain, Pecan, Poplar, Soft Maple, and FSC Certified materials. There are also a variety of grain characteristics and cuts available including Quarter Sawn and Rift Sawn grain, for oak boxes, and Wormy Soft Maple. Some exotic species are also offered, like Mahogany, Teak, and Sapele, for those especially unique projects.